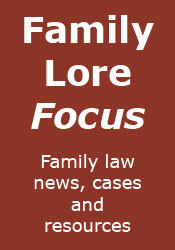 Any family lawyer who has dealt with private law children disputes will have come across cases where the warring behaviour of the parents can be utterly exasperating. In the case of Bruni v Bruni Ontario Superior Court Judge Joseph Quinn vented his exasperation by turning to ridicule to describe the conduct of the parties. He explained: "the parties repeatedly have shown they are immune to reason. Consequently, in my decision, I have tried ridicule as a last resort." "Paging Dr. Freud. Paging Dr. Freud. This is yet another case that reveals the ineffectiveness of Family Court in a bitter custody/access dispute, where the parties require therapeutic intervention rather than legal attention. Here, a husband and wife have been marinating in a mutual hatred so intense as to surely amount to a personality disorder requiring treatment." "If only the wedding guests, who tinkled their wine glasses as encouragement for a traditional bussing of the bride and groom, could see the couple now. I am prepared to certify a class action for the return of all wedding gifts." "The courtroom energy in a custody access dispute spikes quickly when there is evidence that one of the parents has a Hells Angels branch in her family tree. Certainly, my posture improved." "It takes a special level of audacity to utter threats under the roof of the courthouse." On one occasion while the daughter was having contact with the father the mother texted her to ask: "Is dickhead there?" Of this Judge Quinn said: "The New Shorter Oxford English Dictionary defines ‘dickhead’ as ‘a stupid person.’ That would not have been my first guess." Referring to another occasion when the wife attempted to run over the husband Judge Quinn remarked: "This is always a tell-tale sign that a husband and wife are drifting apart". The Judge did not omit himself from a little ridicule. He said that earlier in the proceedings he had 'foolishly' ordered a four-month adjournment so that the parties could attempt to settle their differences through mediation. Referring to this he said: "It is touching how a trial judge can retain his naivety even after 15 years on the bench". All excellent stuff - I bet there are many other family court judges who wish they could give judgments like this, or could get away with doing so. Ridiculous and well done on the Judge for admitting it. Esp. liked the traditional indicator the couple are drifting apart. Yes, it's true that the parties probably wouldn't have been named over here. However, that was not the point of this post.